This book has over 250 simple black and white patterns and 10 photo pages of finished windows. A wonderful tool for custom work. A great addition for any library. 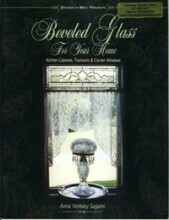 The patterns were designed with bevel clusters or accenting bevels. Select a pattern and add you favorite cluster. Click the button below to add the BEVELED GLASS FOR YOUR HOME to your wish list.